The JCC’s Early Childhood Development Center has an expanded focus of play-guided development for our youngest campers. We offer our two-year-old friends a day of structured activities in a safe environment that support your child’s new found freedom as a toddler. There is a good balance of outdoor and indoor activities. 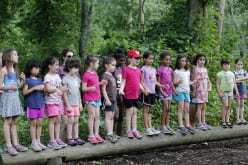 Yeladim introduces your child to the traditional JCC day camp experience, with a field trip each session to J&R Day Camp as well as field trips and visits with local community resources.